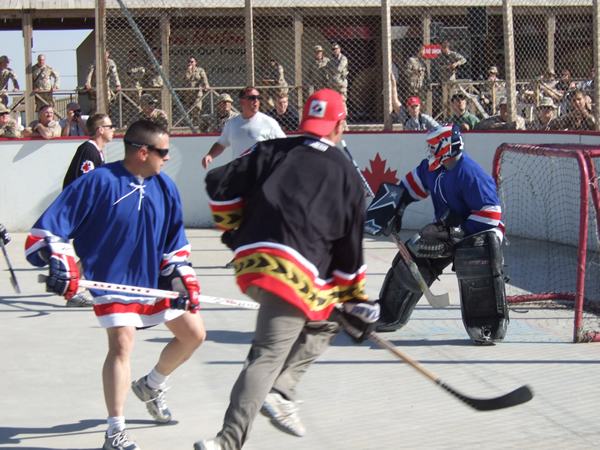 The best training for ball hockey will mimic the actual demands of the sport. That being said it’s not enough to just “go out for a run’ to get in shape. The best type of training for ball hockey is interval training and if done correctly, will allow you to avoid injuries, utilize your skills, avoid mental mistakes and recover faster between shifts. Interval training is when you alternate periods of hard work with periods of recovery. Since you will be running on solid ground during a game, running intervals as opposed to intervals on a bike, treadmill or rowing machine are best. To start all you need is some space to run, and a stopwatch (available on most smartphones) Some watches have interval timers so you can simply enter your intervals into the watch and it will give you a beep indicator for your work and rest sets. Start with a warm up of 5-10 minutes of dynamic stretching and light running. Next you simply start running hard alternating periods of fast running (work interval) with periods of slow running (rest intervals). If you are already well conditioned start with the second workout and gauge the difficulty level. Then you can move down to the next workout only if your level of exertion is at least 2 points below whats recommended. Remember to always consult a physician before beginning any exercise program. Bonus tip: Incorporating changes of direction into your interval workout will make it even more functional as an athletes speed on the court is less about top speed and more about how quickly you can accelerate, decelerate and change directions.